Crappie Fishing Tips and Techniques for Beginners – You can fish for crappie all year round and have a great time while doing so. 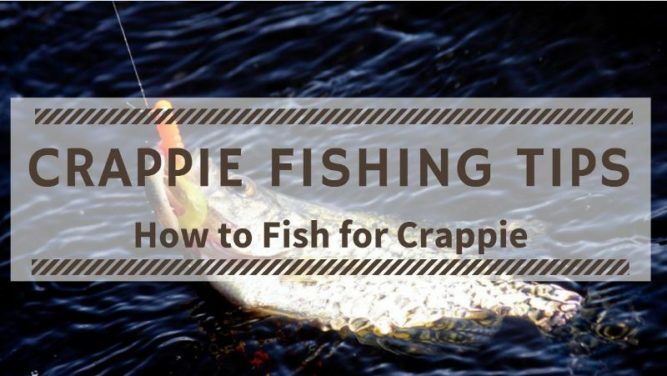 If you are new to crappie fishing, this guide can help you get started. I hope the crappie fishing tips and techniques here can help you learn how to fish for crappie. What Does a Crappie Fish Look Like? What Equipment Do You Need to Catch Crappie? What Do You Do When You Catch a Crappie? You may know the fish by its other names like papermouth, strawberry bass, speckled perch, sac-a-lait, calico bass, moonfish, or dirty sunfish. All these names refer to a North American freshwater fish, which is one of the most popular panfish. There are two different species of crappie: the black crappie and the white crappie. The habitats and habits of both species are the same, the only difference is in their appearance. The white crappie is lighter in color with vertical colorations and a slightly lower dorsal fin. The black crappie is darker, with a higher dorsal fin and no vertical colorations. Now that you know what crappie fish looks like, let us dive into the nitty-gritty of how to catch crappie. Missouri, Louisiana, Mississippi, Oklahoma, and Kansas are some of the best places to catch crappie. They are found in lakes, ponds, rivers, and other freshwater bodies. Crappie usually flocks towards areas with rocks, weeds, bushes, or other dense vegetation. During spawning season (between May and June) the male fish make small depressions in the sand in shallower depths (around three to five feet). This is where the females then lay around 5000 to 60000 eggs. The eggs usually hatch 3 days later. During colder weather, they tend to stay huddled together in deeper water. The colder temperatures make them lethargic, so it’s extremely important to find the right spot to get a bite. Using different rods, you can determine the depth profile which is a key element in catching crappie. There are many different types of fishing poles. But crappie not being the largest or trickiest fish, almost any type of rod will do. You can use the most basic bamboo or cane fishing rod, and still catch some crappie. They are inexpensive, light, and very easy to use. If you are looking to start out without investing too much in the equipment, this rod is for you. You can find cane rods up to twenty feet-while using cane rods, it is better to use the longest rod you can. They are effective at lowering the bait or lure into deep pockets of water. Also, the longer the rod, the less likely you are to scare away the entire school. If you are ready to invest a little more, you should try a telescopic crappie pole. They come with the ease of the traditional cane pole, but with modern materials acting to your advantage. These poles come in graphite or fiberglass models. These are especially useful if you plan on bank fishing. These poles will come in lengths up to twenty feet, like the cane poles. However, unlike the cane poles, these will collapse into much smaller sizes, making it easier to transport and store for when you are not out fishing. Fly rod and reel combos are an exciting alternative to the regular rods and reels. Most flies can be used for fishing crappie since they usually eat prey of about one to two inches in size. A fly rod with a four to six weight reel should do the trick. Remember to keep the fly-line light taught to keep the tip of the rod sensitive enough. The tip sensitivity of the rod is an important part of crappie fishing, whichever rod you may be using. You can also check our recommendation of Best Fishing Pole for Beginners. While crappie fishing, it is better to use low weight lines, between two to six-pound test. Some anglers prefer to use heavier lines when fishing with the cane or telescopic poles. If you will be fishing in heavy brush or other dense vegetation along the banks, you might want to use the heavier lines – up to a twenty-pound test. You should start with a monofilament line, this is what has been used widely up until now. But braided lines have their own advantages. For example, a braided line has very little stretch which is especially useful if you plan on vertical jigging. A smaller diameter and no memory makes the braided lines a better option for casting longer distances. If fishing in dense structures, you might be better off by using a braided line, since a monofilament line may snap very easily. That being said, you must be very careful with braided lines. If you are just beginning to fish, you should be very careful while setting the hook. If not set properly, you risk breaking the line. Crappie fish have a wide range of diet. They eat everything from aquatic insects, minnows, and the young ones of other fish species. This gives you a wide range of options for baits and lures. I am often asked what bait do you use to catch crappie? Using live bait is usually the safest bet. Like most other panfish, crappie prey on other small fish, insects, or any other small meaty baits. A small minnow is the best crappie bait, ranging from mosquito fish to Missouri freshwater minnows. If you are not yet well versed in the art of fishing, using live bait is the best option for you until you get the hang of it. You can buy fishing bait such as minnows in any local fishing shop. They are, after all the most widely used bait. You want to get the tiniest minnows though, ranging from one to one and a half inches. If you are feeling a little more confident and adventurous, you can try to catch some minnows yourself. All you need is a minnow trap or cast net and catching minnows should be your first task once you reach your lake. Crickets are another popular bait to use for crappie. They can be found in abundance anywhere around you, and you can catch them yourself with baits or simply by hand. A lesser used bait for crappie are the grubby larval insects like mealworm and wax worm, but they are popular for ice fishing. Lures are a durable and reusable substitute to live bait. They will last much longer than live bait, for obvious reasons, and you do not need to worry about catching enough bait yourself. Again, due to the wide diet range of our friend crappie, you can use a large variety of lures. Lures come in all shapes and sizes, but the crappie fishing lure you use needs to be chosen carefully. You can go for the small minnows like hard plastic lures, or flies that resemble small bugs, crickets, and grass shrimps. As crappie grow bigger, their diet consists more of fish than insects. Therefore, your best option of catching a fully grown crappie is to use fish-imitating lures. A combination of fish-insect may also work, depending upon your water and weather conditions. Spinnerbaits are another kind of bait you may use. They are small lures with added metal spinners or blades. When retrieved, they are very flashy and draw the attention of the crappie from quite far away. All these lures look eerily like the real fish and look like a live bait. If the fish are shy to bite, you might have to try a combination of these lures and baits. This is where you can test your creativity in selecting the right size, shape, color, and form of lures, in combination with bait. The weather and water conditions also play a large part in your selection. Jigs are the most versatile and effective of the crappie fishing lures. The most wonderful part of jigs is that they already come with weighted heads. You do not need to add extra weight to the line. This is good for fishing thick vegetation near shores. It will also work well in deep water because of the weighted heads. Some newer models come with weights inside the jig so that all the fish sees is the lure. When you combine these jigs with a soft plastic lure, it forms a kind of tail to the jig head. They tend to work even better together. Their soft material is good for imitating the movement and appearance of an actual live fish. Once you cast them in, they create noise and movement which helps in attracting your target crappie. In dark waters, you might have to use bright colored lures to catch the crappie’s attention. During the spawning season, a lightweight jig may work better. It is up to you to test and try what crappie jigs work best for you and your crappie. During the summers, you will get the best results by using spinnerbaits while trolling. The fish will only come up from the bottom during early mornings and evenings. The fall sees the crappie come again to shallower waters for feeding. You can try techniques like casting minnows, or vertical jigging. Like always, look for structures and vegetation to locate the crappie. The bite is especially slow during winters. The cold temperatures make the fish slow and unresponsive to most lures. They also remain in deep waters and holes, making it slightly difficult to locate them. This is where you need to be most patient. Keep trying different depths first, and then different baits. Leave the bait still with occasional movements to attract the fish. You will have the best results using live baits or at least a combination of bait and lure. During the spring, you can fish with bait like jigs or minnows suspended on bobbers. The best place to look for them is near structures and vegetation. During this season they are usually in shallower waters and creek beds. Wait, contain your excitement a little! Your job is not done yet. You still need to keep the crappie fresh till you reach home. Clean and prepare it to so you can put it on the table. Care needs to be taken to keep the fish fresh during your drive back home. The crappie needs to be stored in a cooler box. During the colder seasons, you might be able to get away with a cooler filled with the lake water. But in warmer temperatures, you should bring a cooler filled with ice. Put the crappie in the cooler as soon as you catch it. Also, do not forget to clean it as soon as you come ashore. Once you are home, it is advisable to cut it into fillets and freeze it in plastic bags. Remove the skin and bones and freeze the meat below 40°F. Of course, the fresher it is the more flavorful it will be. However, if you do not plan to cook it right away, do not worry. You can store the crappie for about six months in the freezer. When you are ready to prepare them, simply thaw them in advance. You can enjoy the crappie pan fried, deep fried, grilled, or baked. It is all up to you. You can also use it in your favorite freshwater fish recipe. It will always taste good. Well, you are now ready to go catch your crappie. Simply remember how weather might affect your use of gear and techniques. Do not get carried away, because every state has its own limits on the size and number of crappie you fish. Do not forget to look it up before you go. Most of all, be patient and do not give up. You may not get the fish to bite immediately, but remember the different methods we discussed here. Do not be afraid to get creative and try out your own ideas. Please let me know the Crappie Fishing Tips & Techniques worked for you and share your crappie fishing experience in the comments below. What are you still waiting for? It is time to catch some crappie! This tutorial is a part of our Fishing Tips series. Other fishing guides in this series are Fishing Basics for Beginners, Fishing Tips for Beginners, Bass Fishing Tips, Trout Fishing Tips, Crappie Fishing Tips, Fly Fishing Tips, Lake Fishing Tips, Pond Fishing Tips, Surf Fishing Tips, and River Fishing Tips.